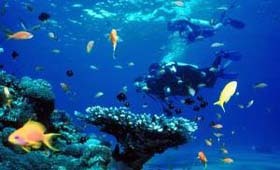 Experience three of the best diving venues in Africa - Sodwana Bay for coral reef diving and Aliwal Shoal and Protea Banks for shark diving. 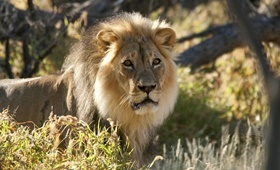 You will also visit Hluhluwe Game reserve, one of Africa's top Wildlife Safari Parks where you can see the the Big Five. DAY 1: Arrival at Durban's King Shaka International Airport. 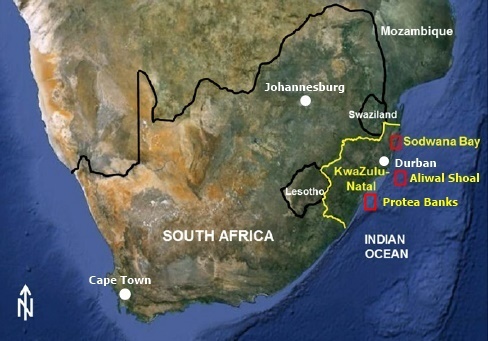 Transfer to Sodwana Bay approximately 5 hours north of Durban. 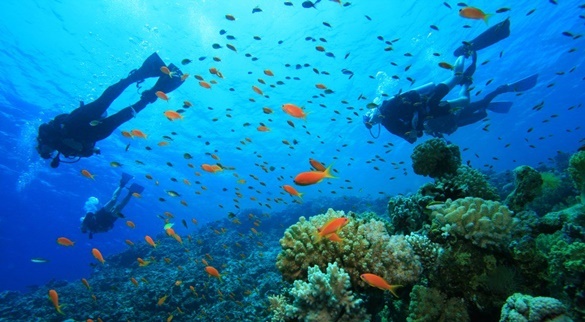 DAY 3: Early morning and late morning coral reef dive at Sodwana Bay. Free afternoon. Breakfast and dinner included today. DAY 4: Morning Dive at Sodwana Bay 2 mile reef. Check out of your accommodation at the dive resort and transfer to Hluhluwe Game Reserve. We do a few hours game viewing before checking into Hilltop Camp. Guests will then go on a night game drive before enjoying dinner at the camp restaurant. DAY 5: Breakfast is followed by another game drive before we transfer to Umkomaas and Aliwal Shoal. In the Afternoon we visit U Shaka Marine World. DAY 6: Morning baited shark dive followed by a wreck/reef dive. Free Afternoon. DAY 7: Baited Shark Dive at at the Protea Banks. 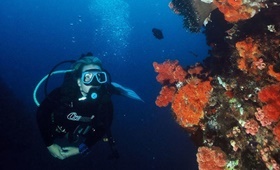 Situated 8km off Shelly Beach, Protea Banks is a unique reef system. The presence of a great diversity of game fish attracts a wide variety of top predators seen in only a few places in the world. 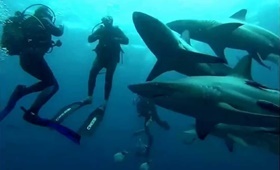 Divers have the opportunity to experience a SHARK dive that is completely unique. 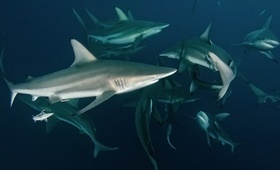 There are only a few places in the word that you can see such a wide variety of shark species and it is certainly not uncommon to see up to 5 different species of SHARKS on a single dive. Included: All transfers and transportation, seven nights accommodation, six breakfasts six Dinners, Eight open water dives, Entry fees to Sodwana Bay Park and the Hluhluwe Game reserve, Diving permit, 1 night game drive, 2 game drives in our own vehicle, entry to U Shaka Marine World. Air Bottles and weights are provided.